Move over, Ryan Adams. Martin O'Malley, former Governor of Maryland and current 2016 Democratic presidential hopeful, just performed a Taylor Swift cover of his own. During an appearance on The View Tuesday, O'Malley broke out a guitar and proceeded to launch into an impromptu performance of "Bad Blood," to the hosts' delight. Soon after he started the tune, Whoopi Goldberg, Raven-Symone, and The View's other co-hosts began clapping and singing along. Unsurprisingly, O'Malley's performance ended with an incredible round of applause. O'Malley's "Bad Blood" cover is definitely a welcome reprieve from the seriousness surrounding the 2016 presidential election. After speaking for fewer than 18 minutes at last week's debate among Democratic presidential candidates — for comparison, Hillary Clinton spoke for more than 31 minutes — he's back in the spotlight. His Taylor Swift rendition makes him a more relatable candidate for voters who may not know much about him, and the performance shows that politics doesn't have to be all work and no play. And since O'Malley isn't doing so well in the polls — he's registering at less than one percent, even after the debate, according to Real Clear Politics — a Taylor Swift cover could be just the publicity bump he needs. 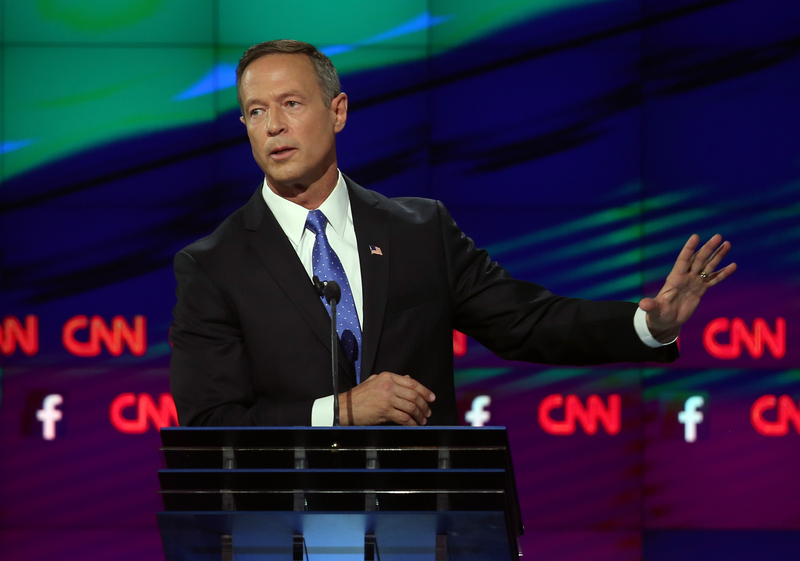 So who exactly does Martin O'Malley have "bad blood" with? Before he began singing, O'Malley noted that Katy Perry, the rumored subject of Swift's song, will be attending an Iowa benefit event for Hillary Clinton. He refused to mention Clinton by name, though, saying only that Perry was attending an event to support "one of [his] opponents." Neglecting to specifically name one's enemies is an age-old Swift trick — no one really knows who "Bad Blood" is about — and now that O'Malley has officially declared his allegiance to Team Swift, maybe he'll be the next person Swift decides to bring on stage at a concert. We're willing to bet that O'Malley would fit right in with Swift's noted squad. Even if O'Malley doesn't become the next president of the United States, his Swift cover may well be one of the most entertaining moments of the 2016 election season. And whether or not his poll numbers increase, the performance is still something other presidential hopefuls could take a cue from. People respond well to fun, relatable candidates, and O'Malley is reminding us that politics don't need to be stuffy.